….basically this is to do with the inherent cruelty associated with the industrial egg production system, whether battery, barn, free range etc. Fundamentally, I guess that every time human beings exploit animals by forcing them to live like machines in an environment that is optimised for some sort of production (i.e. egg production in this case), there is inevitably going to be cruelty and slaughtering involved. 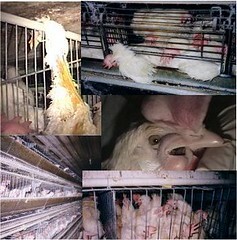 So as we don’t need eggs to live, why not free ourselves from all this unnecessary cruelty by avoiding eggs altogether? 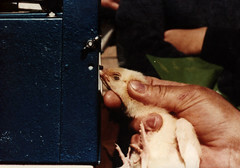 Specifically, as regards the cruelty of egg-production, it may generally be well-known that the battery system is cruel because of the cramped environment that the hens are forced to live in all their life (e.g. 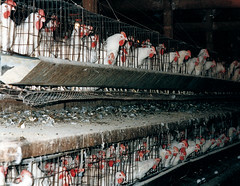 each hen is forced to live her life in a space the size of a sheet of A4 paper). 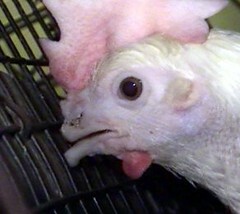 These hens are also “debeaked” (a mutilation process known to cause pain) to prevent them from pecking one another (since living in cramped conditions day in day out naturally leads to stress, aggression, cannibalism, etc. or the hens can accidentally peck one another since they have virtually no space between them). However, even the other “higher welfare” system (e.g. barn eggs and free-range eggs) are cruel for various reasons. One thing that we cannot get away with in all these egg-production systems is that they involve slaughtering at two stages: (a) during breeding, and (b) when the egg-laying hen’s production level falls (at about 72 weeks old). Regarding the breeding of the egg-laying hens (to produce more eggs), for every female chick that is born like this, there is always going to be a male chick too. What happens to the male chicks? They are killed by being gassed. All the above indicate to me that there is considerable himsa (violence) associated with commercially-produced eggs, and therefore eating eggs is not Jain and not vegan. I believe that in Jainism, even if it were possible to obtain ahimsa eggs (e.g. from a hen living happily and freely at a sanctuary and if she’s laid an egg that she chooses to abandon rather than mother), even in that case, that egg would be forbidden to be consumed if following a strict Jain diet. I’ll leave it to someone else to explain why that is the case. Essentially, egg laying hens are only useful [to an egg selling company] so long as their productivity of egg production is high. However, once they have passed their peak of egg production (after around 72 weeks), it is no longer economically viable to keep them for egg production (as the cost of feeding them, cleaning them etc, outweights the value gained from their egg production). These hens are sold on and sent to the slaughterhouse for prices as low as 2p and used for as things such as chicken soups, pasties etc. This means that even forest eggs, which apparently have better welfare standards than free range eggs, are not free from cruelty. The same argument applies to leather and milk. My grandma (who, incidentally doesn’t wear leather herself) often tells me that in India, it is generally fine to wear leather because you are simply taking the skin off an animal that is already dead. Unfortunately this is not reality. So long as the animal has been reared / killed for meat production (as is normally the case), the money paid for the leather subsidises the cost of meat production and thus subsidises the meat industry (you can see this using a simple model below). Imagine it costs a farmer £5 to rear a cow. Imagine that the beef produced from the cow is worth £4, and that the leather is worth £2. If only the beef can be sold, then the farmer will make a £1 loss by selling the cow, and thus (s)he will choose not to rear the cow (assuming he can choose whether or not to force production – for example (s)he may not artifically inseminate the cow to force production). 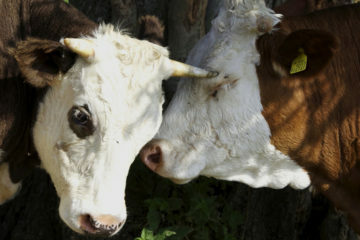 If the farmer knows that the leather will be bought by a vegetarian who thinks that it is ok to purchase leather because the cow is ‘already dead’, the farmer knows (s)he will now receive £6 revenue from the cows body parts, and knowing this the farmer will choose to rear the extra cow. Thus the vegetarian may actually be supporting the production of meat without consuming it himself. The unfortunate truth is that this line of thinking can be extended to a lot of things. 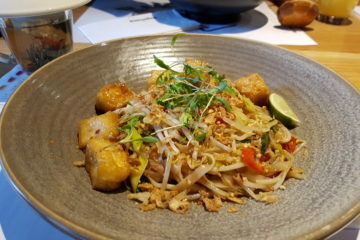 By purchasing food items from many restaurants, as vegetarians and vegans we invetably end up subsidising meat production in one way or another. For example, when I eat in canteens at University, the same price is charged for both vegetarian / vegan and non-vegetarian dishes. In general, non-vegetarian dishes cost more to produce than vegetarian dishes (especially when organic etc). Thus by eating at these places, I inadvertently end up supporting the meat industry. The more I think about it, the harder it becomes to avoid supporting the meat / non vegan industries in anyway. I guess the key is to think and find out as much as possible about what you purchase and think about alternatives which may be better aligned with your personal beliefs.